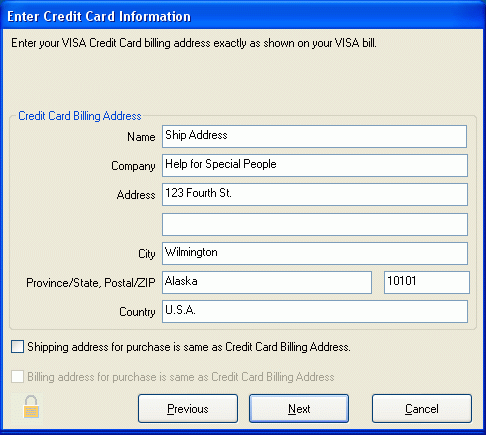 Enter your Credit Card billing address exactly as it appears on your bill. Check this box if the address you would like your product shipped to is the same as the Credit Card billing address, this will save you re-entering the information. Check this box if the address you would like the invoice for your product sent to is the same as the Credit Card billing address, this will save you re-entering the information. Press this button to return to the previous step. Press this button to confirm your selection and move to the next step. If the address entered is incomplete you will not be able to proceed.